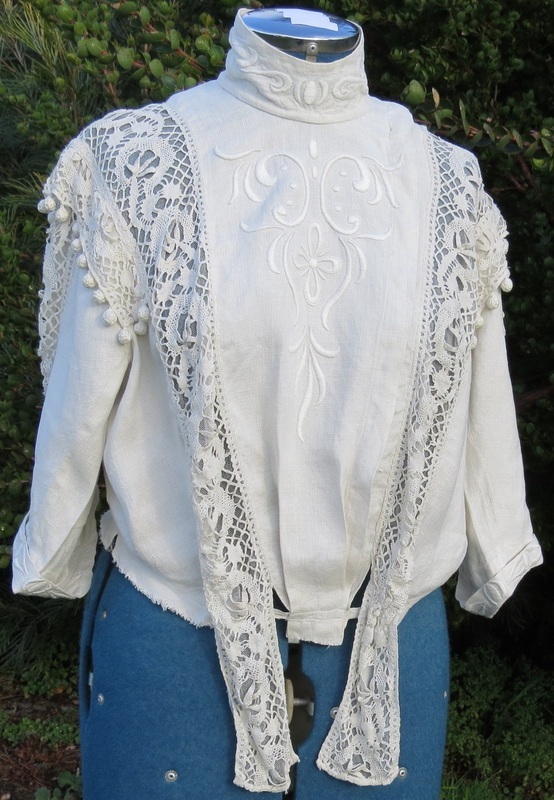 EDWARDIAN & LATE VICTORIAN L 2 Antique linen items generally have the potential to last longer than other fabrics, and are therefore more expensive. Ecot17 Started out as a nightgown, but OK for a bridesmaid. B 94, W 80 (could tighten with white or coloured ribbon through the lace). Length 130cm. Sturdy cotton. $70. Elin4 Grand ivory 3-piece linen suit, top of our range. The jacket could be worn over modern outfits. 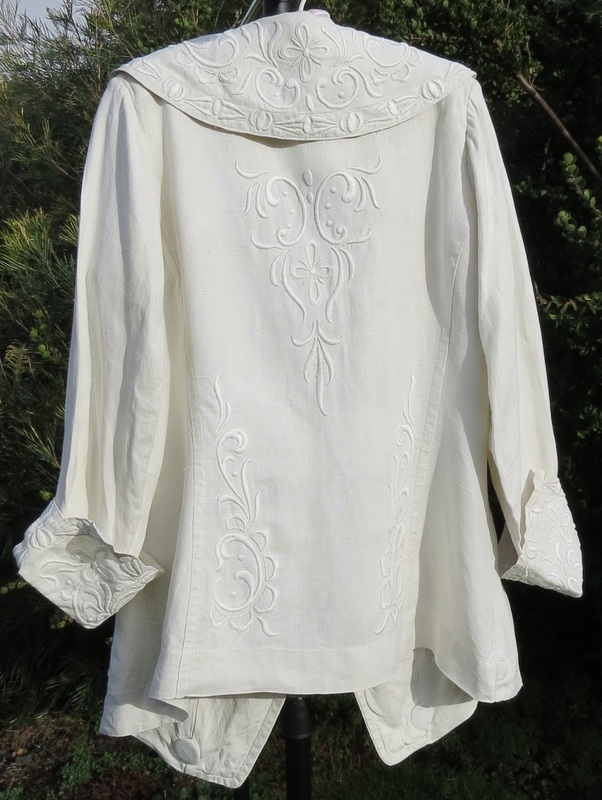 It has longer sleeves than the bodice (45cm from underarm to end of cuff). B 116cm. Length 73cm at the back, longer at the front. 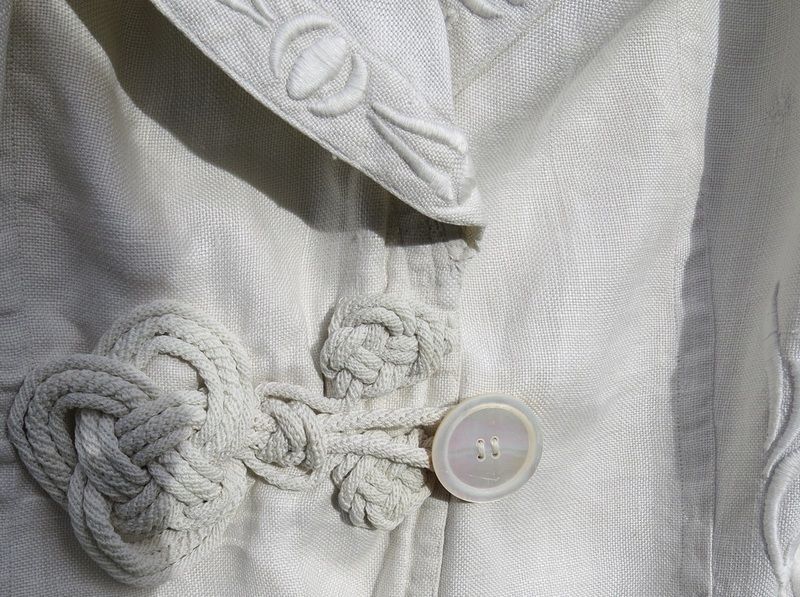 Large rope frog fastening with large mother-of-pearl button. The photo below shows a small mend (top left). Elin4 back of jacket. 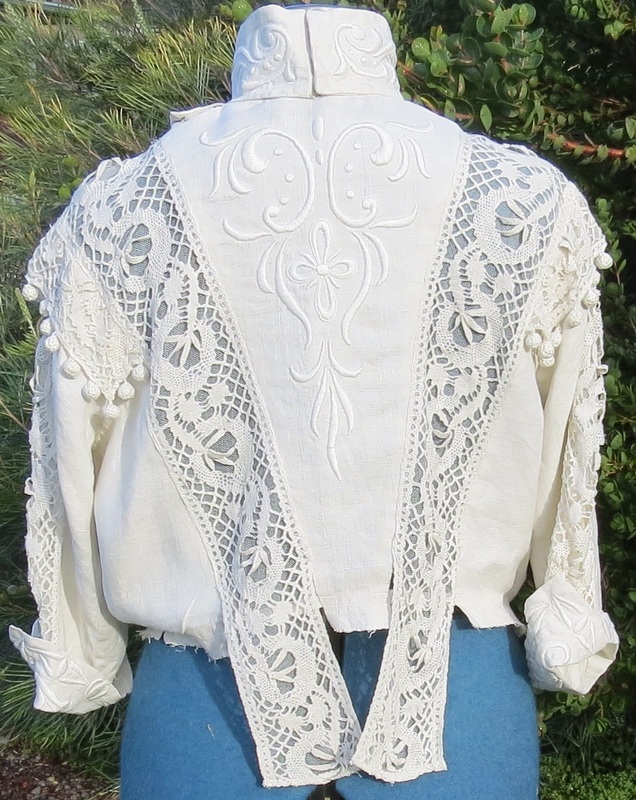 Hand-done raised crewel embroidery on front, back, collar and cuffs of the jacket and bodice. The bodice and skirt fasten with concealed hooks and eyes on the left, extending around to the back of the bodice collar. 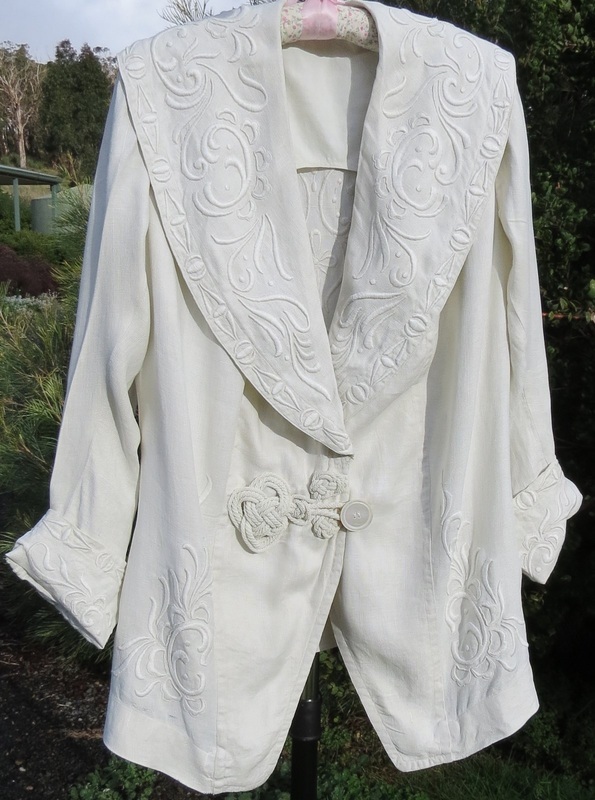 3-piece suit $600, including a lace belt which is a good match (photo to be added). Elin4 Pigeon-breasted bodice B 109, W 84, length of back is fairly short at 38cm (lower margin of collar to waist), plus 2.5cm to tuck in. 3/4 length sleeves. The bodice has crocheted bobbles (drippery) and crocheted lace inserts with dangling lappets front and back. 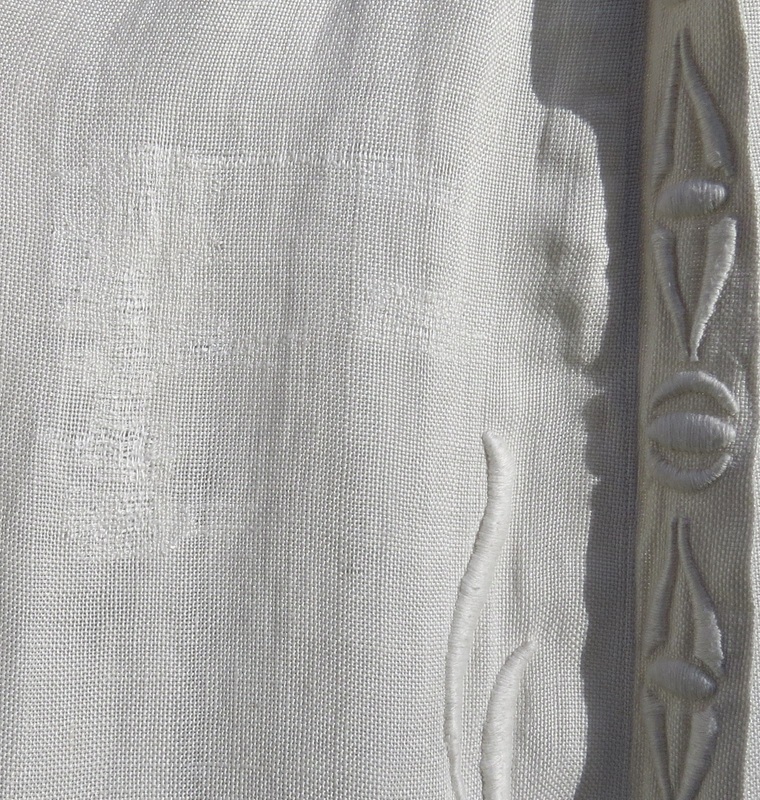 As was common at that time, the lower border (to be tucked into the skirt) is not hemmed. Elin4 The embroidery on the front and back of the skirt is asymmetrical, extending down one side and part-way across, plus around the hemline. W 84cm, length 96. 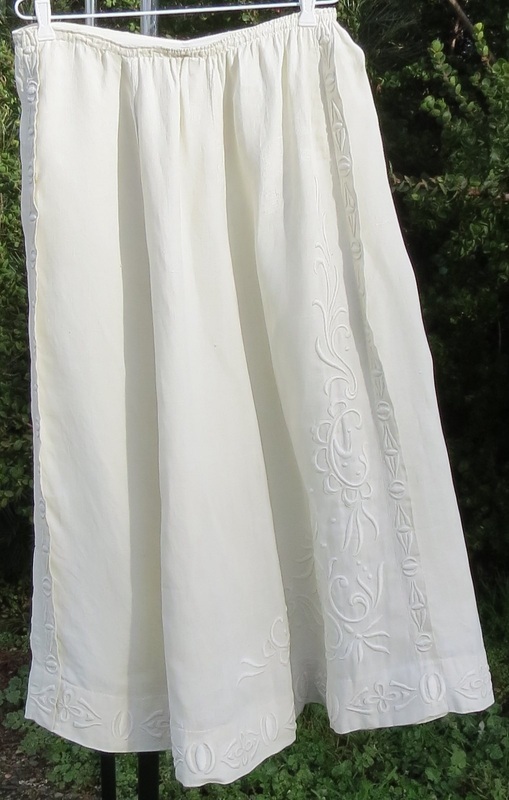 The suit has a few areas of fabric thinning, and the skirt back has an area which may have been re-woven (photo below). Somebody loved this outfit!